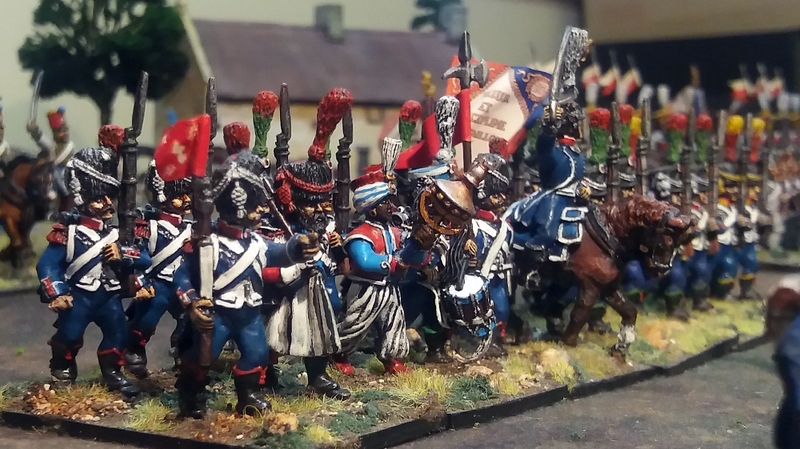 Continuing this series of postings in which I inspect all the wargaming figures I’ve painted over the years, we come to the largest army in my collection – the Napoleonic French. ‘Valeur et Discipline’ – valour and discipline. These words proudly emblazoned on their flags, the soldiers of Napoleon’s Grande Armée marched and fought their way right across Europe in a series of bloody wars during the first decades of the nineteenth century. 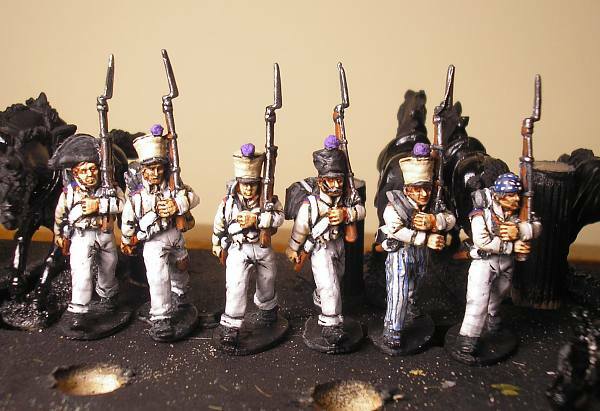 In the early 2000s I began painting my own miniature Grande Armée for playing wargames. 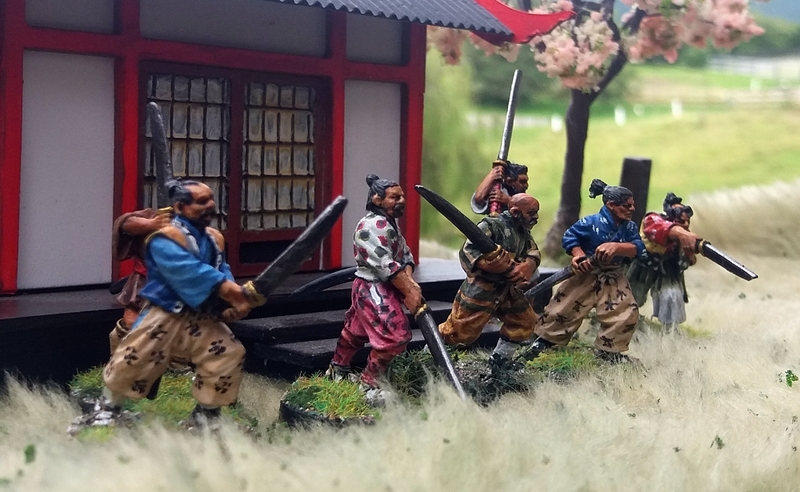 When I put lined them all up this week to photograph them for this posting – the first time I’ve ever had the whole army out at once – I was astonished at just how many I had actually painted! In this posting we’ll take a look at the most basic component of any army, namely the infantry. The cavalry, artillery and guard will be covered in later postings. Remember that you can click on the pictures to enlarge them to their full glory! There’s a very eclectic mixture of units and time periods in my army. 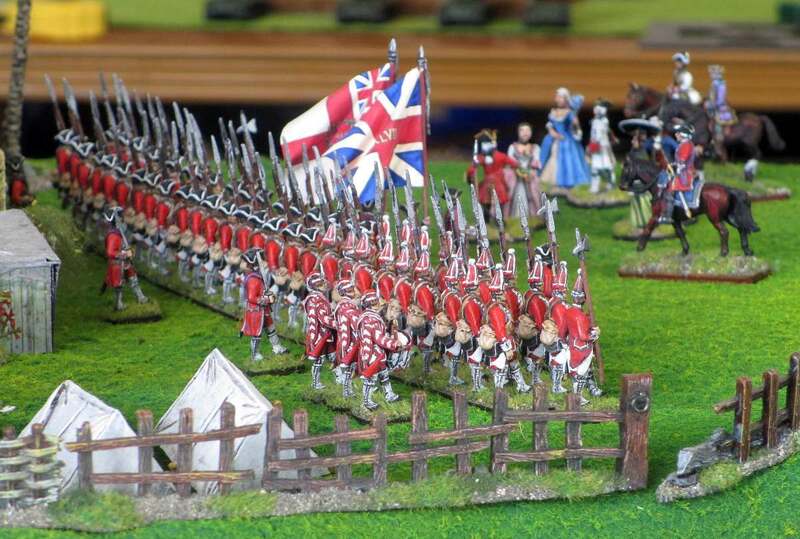 Unlike many wargamers, I do not follow a historical order of battle when selecting units for my miniature armies. 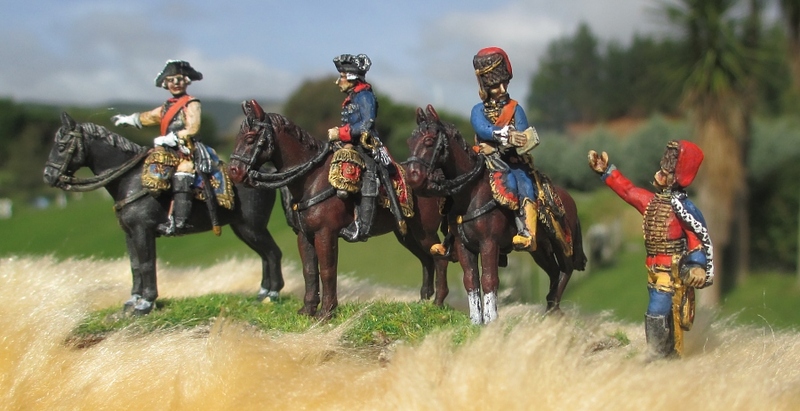 Instead, I go for the units that will look the best in my display cabinet and on the wargames table, by choosing those with the most interesting or colourful uniforms and flags. The above picture must be reminiscent of the enemy’s view of a French column bearing down on their lines, preceded by swarms of skirmishing voltiguers. 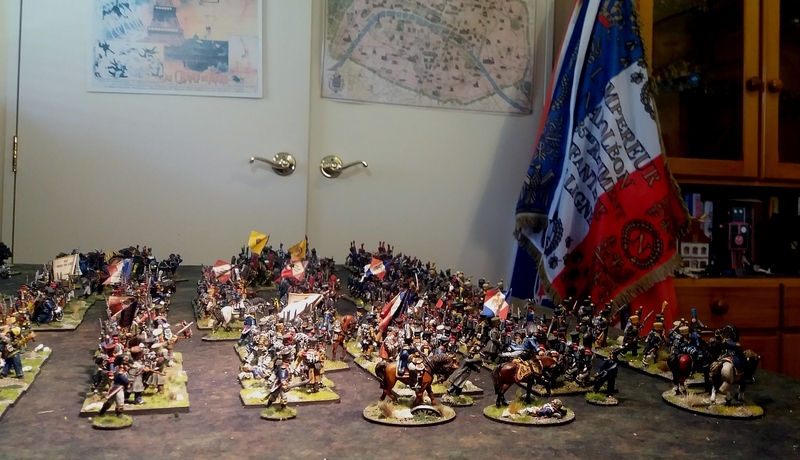 Following is just a small selection of the infantry regiments in my French army. As French infantry regiments of the Napoleonic period tended to wear very similar uniforms and carried flags that differed only in the wording, my selection was often based on the more colourful uniforms worn by the “têtes de colonne” (heads of column) – the drum-major, drummers, musicians and sappers who marched at the head of the column (as in the 9e Régiment d’Infanterie de Ligne using Front Rank miniatures shown above). I decided to go the campaign dress way, as I thought they would look less rigid than all in full-dress. But I also threw in a few men in full-dress to add even more variety. 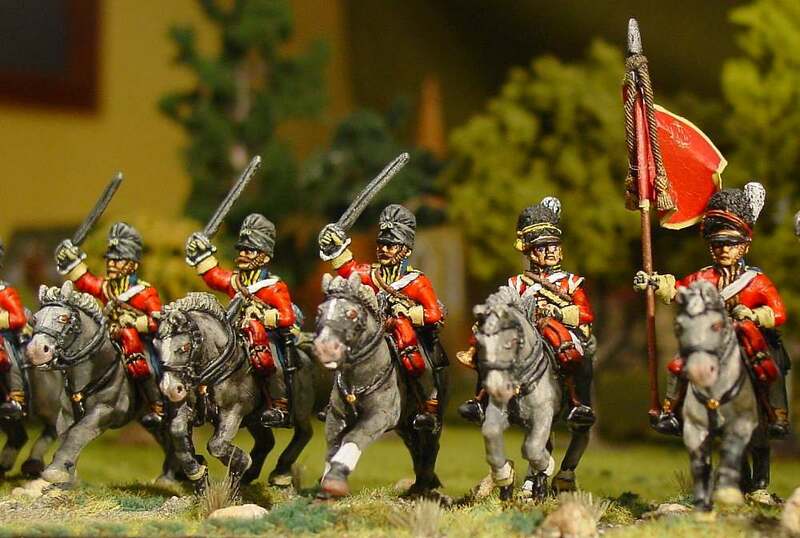 So you’ll see some of my soldiers wearing patched multi-coloured trousers (one even has pink and blue stripes), and others with breeches and gaiters. They wear all sorts of headgear – shakos (a few with cords, others with cloth covers), bicornes, bearskins (with and without plumes), bonnets de police, and even a couple with no hats at all. 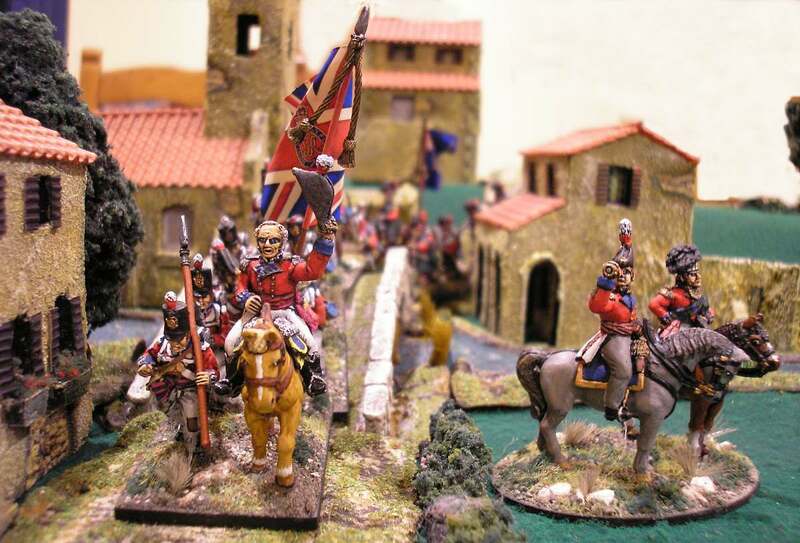 The Perry regiment above has an even greater campaign look. Each soldier is an individual, some in soft pokalem hats, others in shakos, some dressed in great-coats, and others in habit-vestes. I added even more variety by painting the greatcoats in different shades of grey, beige and brown. I had even more fun adding a patch or two, and even some ripped knees on the trousers. Actually, there’s a story to the above regiment. Back in 2005 my son and I were fortunate enough to take part with the recreated 85ème Régiment d’Infanterie de Ligne in a reenactment of the Battle of Waterloo. 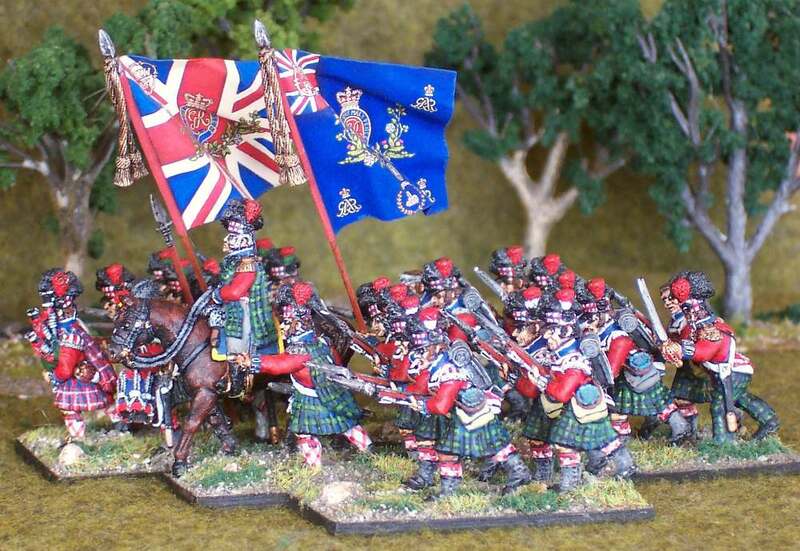 So it was only natural that I chose to portray this regiment. 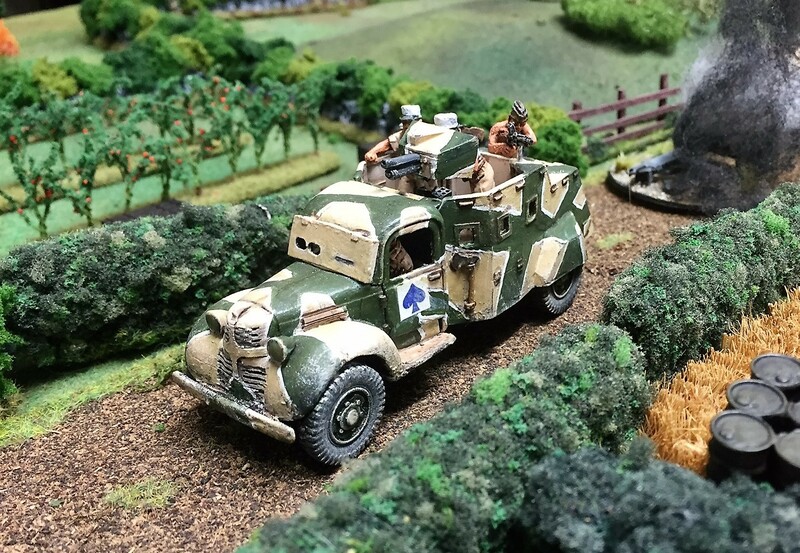 The overall look I wanted was for a couple of tightly-packed ranks, followed by a supernumary rank of officers, NCOs, drummers and even a wounded straggler. I think this looks more realistic than putting those kinds of figures in the main ranks, which is what I’d done up till then with all my other units. 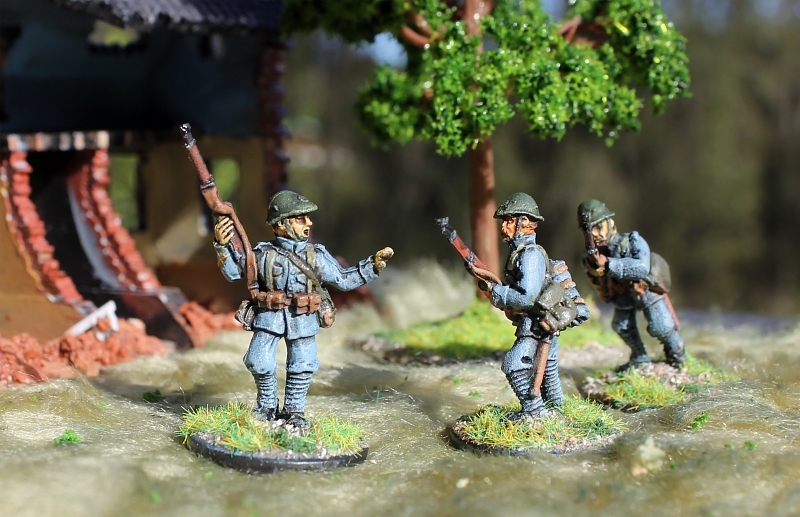 It might mean a few more figures to paint per battalion, but not too many, especially with judicious use of lying wounded figures, which can take the space of one complete file. 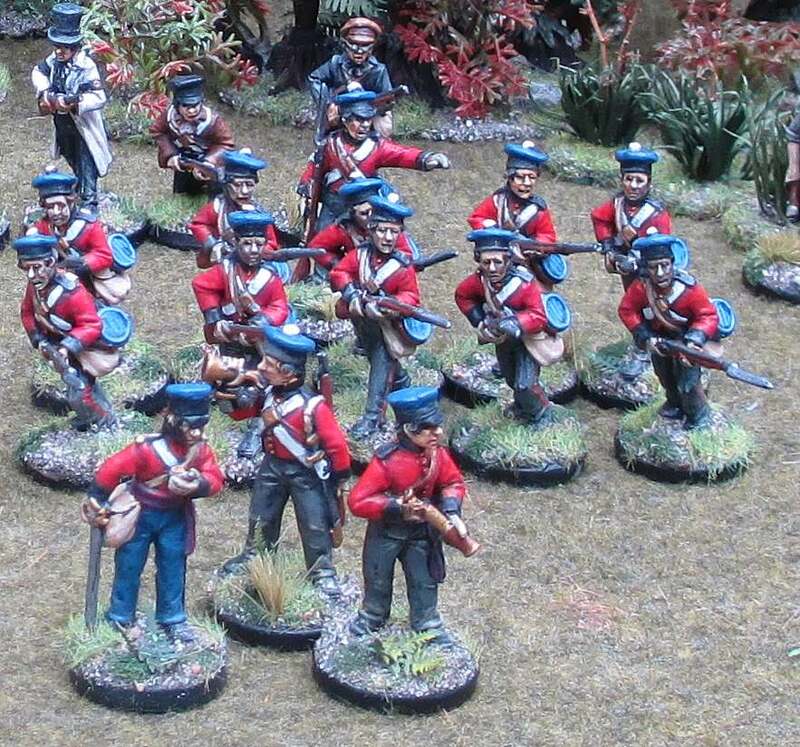 Perry Miniatures produce a set of casualty figures, which I have incorporated into my regiment. An officer caught swinging round as he is hit is one of the nicest figures I’ve ever seen, despite the morbid subject matter. 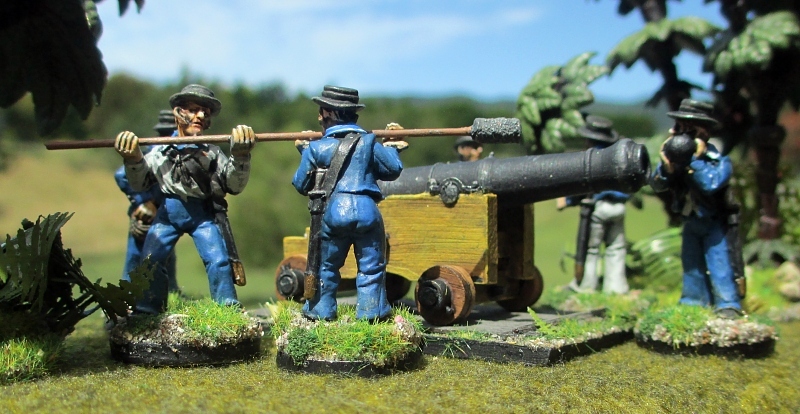 As they were the main player in the Napoleonic Wars, any company that produces a range from that conflict has to include the ubiquitous French infantryman. But there is sometimes a certain sameness about many companies’ offerings – full dress uniforms, or campaign uniforms that are only barely different. 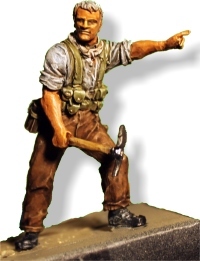 So when I saw an advertisement for a new range of 28mm French infantry who were not only in campaign uniform, but also wearing waistcoats rather than the more normal jackets, my interest was piqued. 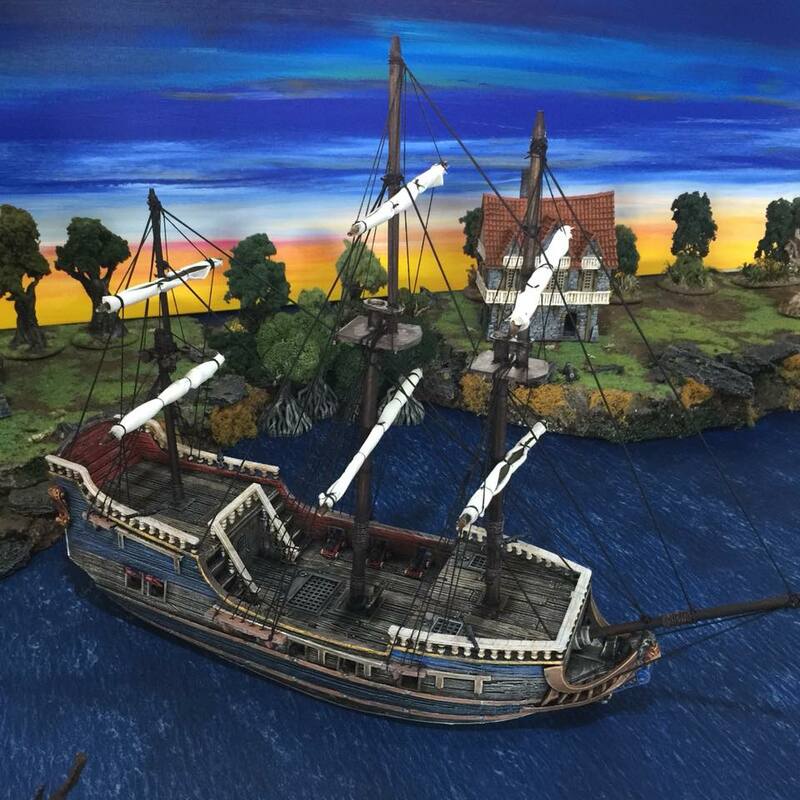 So off went my order to Companion Miniatures. 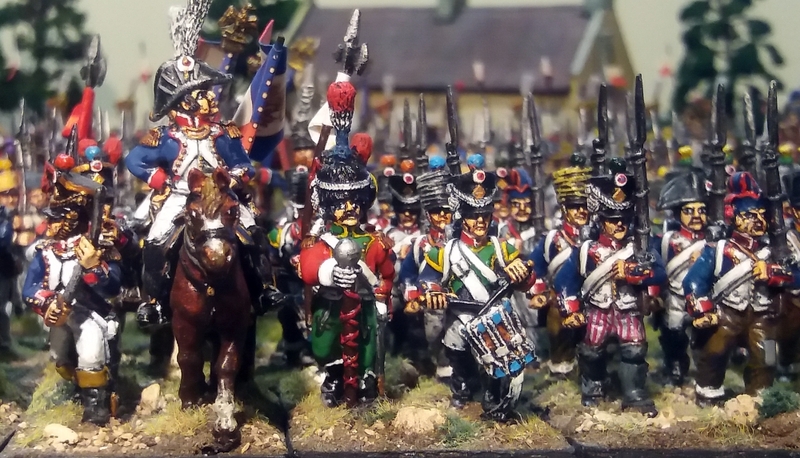 These figures aren’t just in their scruffy white waistcoats, but they also feature lots of different types of headgear, including covered shakos (some with neck-cloths), head-scarves and fatigue caps, civilian bicornes and straw hats. The command figures included an officer, NCO (who is wearing clogs! ), standard bearer, second eagle bearer, sapper and drummer. They are not in waistcoat order like their men, but I think this is probably quite realistic. The colonel is mounted on a donkey, which is a decidedly different touch. I noticed an odd thing while I was painting the Companion figures – some of the faces came out looking like famous people! Can you see former British Prime Minister Harold Wilson, “Young Ones” star Nigel Planer, and actor John Thaw from “Inspector Morse” and “The Sweeney”? 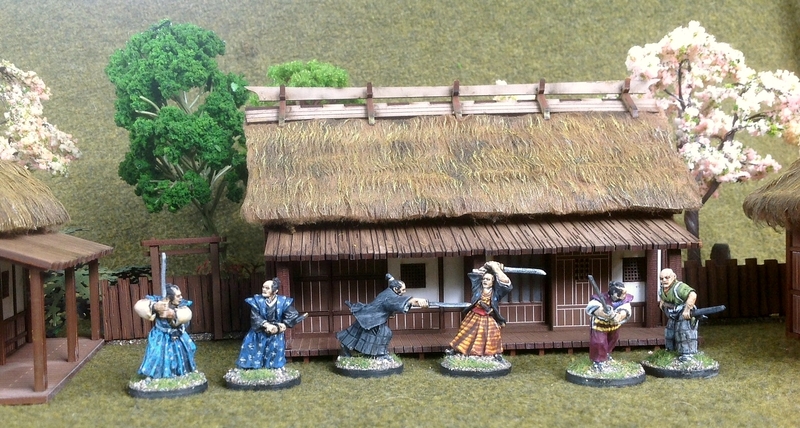 Sadly, the bad news is that the company Companion Miniatures, to my knowledge, no longer exists. A real shame, as their figures were beautiful. 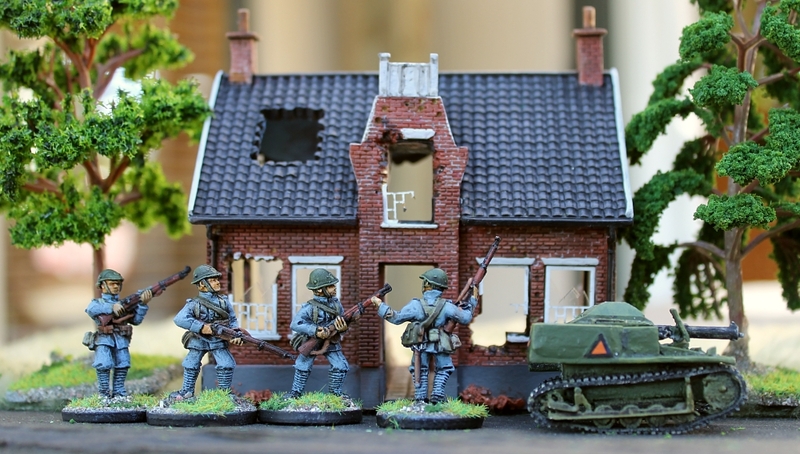 This proposal met with an enthusiastic response amongst the Fusiliers. Before long, we had enough companies to form not one, but two battalions of the Kapiti Fusiliers. 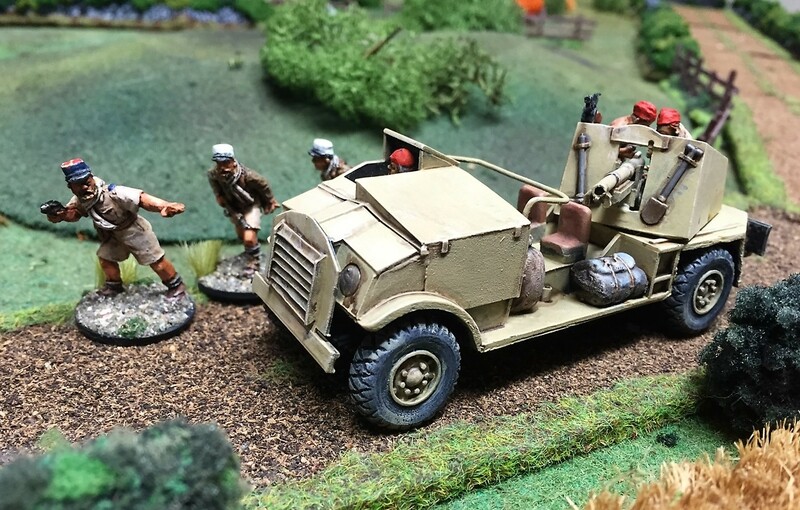 They were painted by Fusiliers Michael MacGillivray, Mark Case and Phil Roberts (USA), Mark Temple and Chris Kendrick (Australia), Eric Veitl (France), and Peter Haldezos, Scott Bowman and Roly Hermans (New Zealand). A truly international regiment! 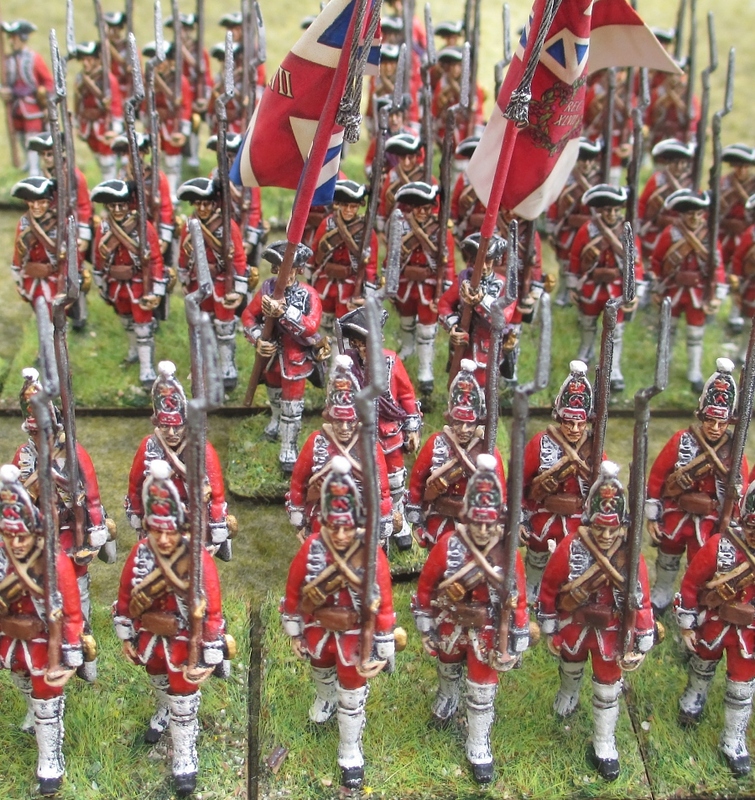 The Kapiti Fusiliers Regiment first ‘saw the elephant’ on 16 June 2007 in the Battle of Segensburg, the first in a short series of battles in a mini-campaign. The various recruiting sergeants from far and wide across the world were pleased to hear they behaved very bravely. 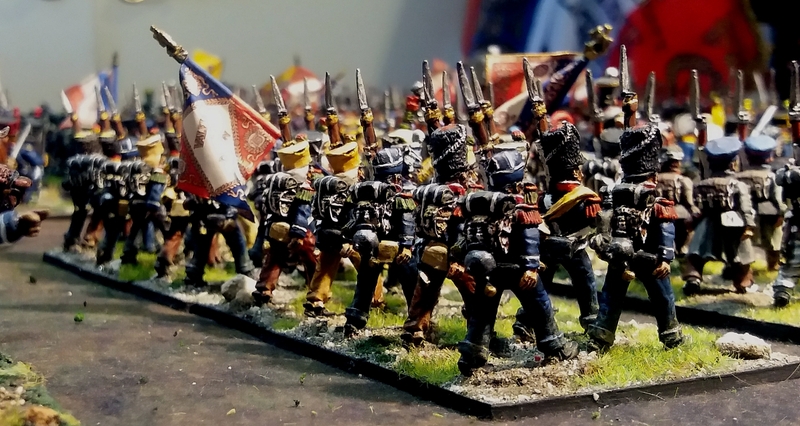 The second battalion was so well-painted that a Russian regiment was so overcome at their finery that they took to their heels before contact was even gained – or at least that’s what we’ll believe was the cause of the rout! Although the Kapiti Fusiliers Regiment is barracked in my display case, they don’t really belong to me, but to all the Friday Night Fusiliers who contributed. 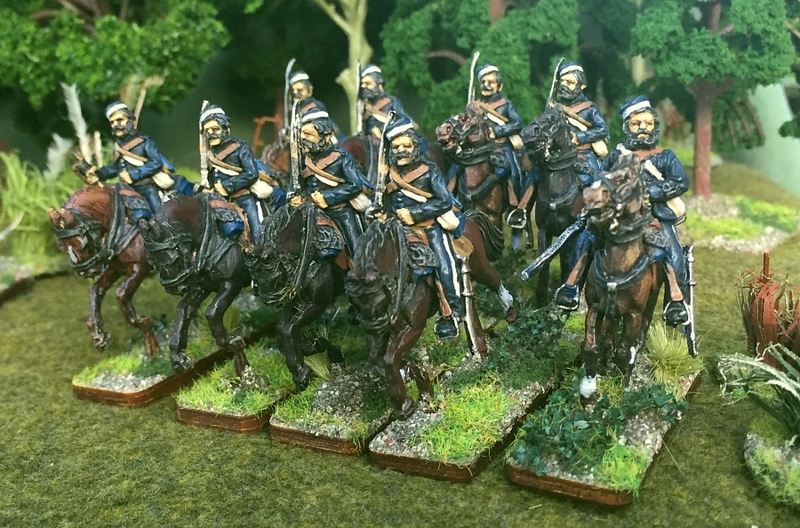 French light infantry considered themselves a cut above their brothers in the line infantry. 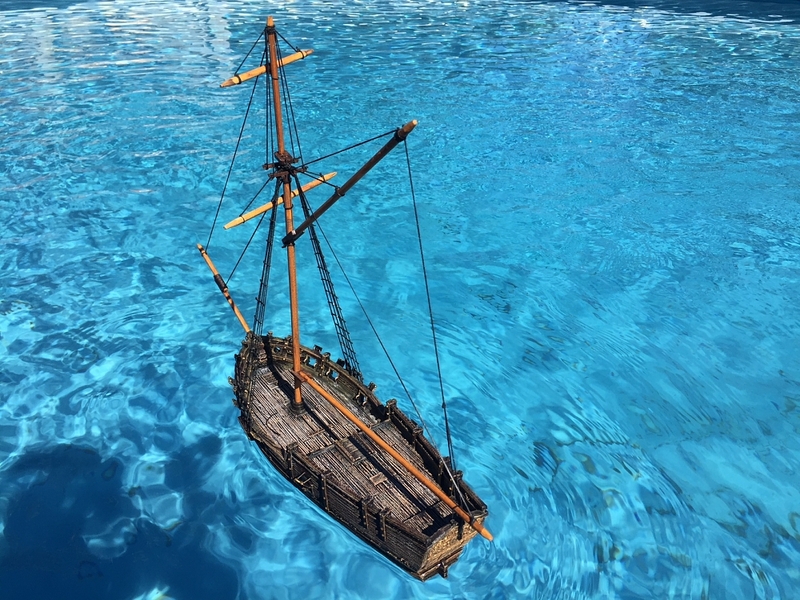 Their uniforms, with blue trousers, lapels, cuffs and turnbacks, were were often further embellished with fancy epaulettes and tasselled gaiters. I loosely modelled the above light battalion on the 15ème Régiment d’Infanterie Légère, using Front Rank miniatures. The musicians of the ‘tête de colonne’ are dressed in very colourful uniforms. There’s also a black musician is wearing an exotic oriental costume and carrying an instrument called a ‘jingling johnny’. I’ve got another battalion of the 15ème Légère in my army, but wearing campaign-style uniforms rather than full-dress. The second battalion’s large green and red plumes and short hussar-style boots are packed away. 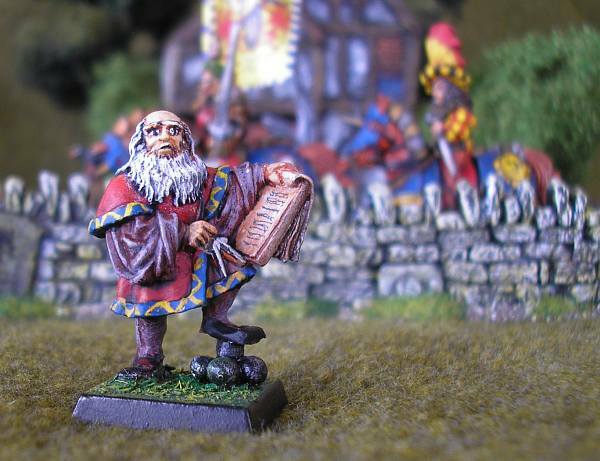 These are again long-gone Companion Miniatures, so sadly you won’t see their like again. As someone famous once said, an army marches on its stomach. And here to provide some of the sustenance (though the French generally had to live off the land) are a couple of cantinieres of the 15ème Légère. The donkey cart is a New Zealand-made product from an old company called Wildly Inspired, though I have changed the medieval wheels for Hinchcliffe limber wheels. 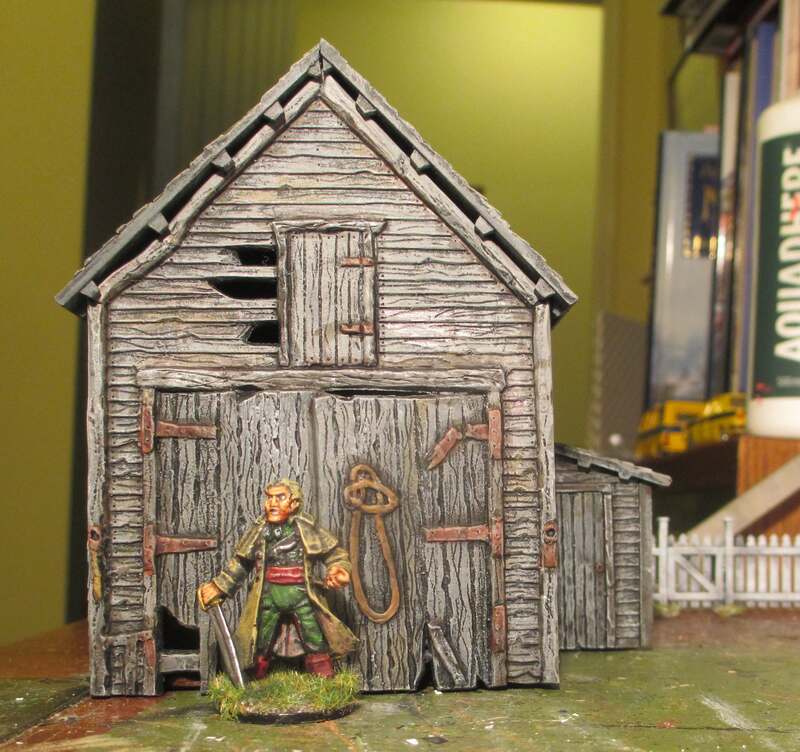 In the background is a wonderful supply wagon made by Perry Miniatures. 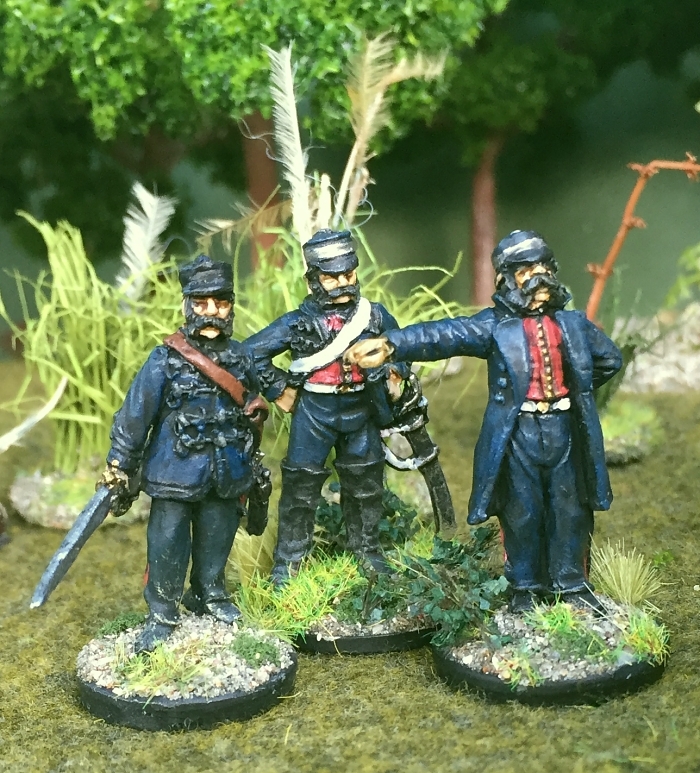 Finally, it’s not always battle – there’s also time for my miniatures to relax and chat, as these Perry figures demonstrate! Absolutely brilliant! What a superb collection! Great work!